Well, I’m getting a little bit farther north with these blogs. J’s vacation got cut a little short as she had to go back to work Thursday and Friday. She took B and her mom back to Kalamazoo with her so L and I could go to my parents for a couple of days. If you follow along at all, I’ve said in the past that I grew up in a small town not near anything. The closest McDonalds is 20 minutes away and the closest grocery store is the next town over. There’s a family restaurant, a pizza place, and a Subway when it comes to meal choices in my hometown. Those don’t always work great for kids. The first day that I was in town with my parents, my mom wanted to take L shopping. She had some coupons for JC Penny which got L a couple of dresses for next to nothing. We had a couple of other errands to run and eventually ended up on the west side of Kankakee. I haven’t lived in that area for well over ten years so I hate when my parents ask me what I want to do for lunch. I finally told them they had to decide and out came a familiar name in a unfamiliar location. 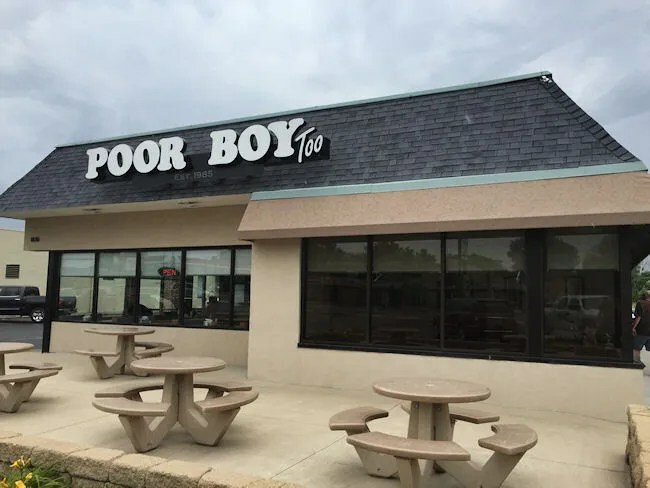 Poor Boy Restaurant has been in Kankakee for as long as I can remember (1985 to be exact…I was 5…so yeah, as long as I can remember). The location on East Court Street is nothing fancy. but it is full of delicious food. 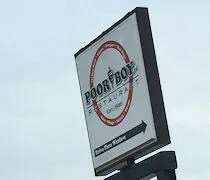 The second location of Poor Boy Restaurant, titled Poor Boy Too, is on West Court Street in Kankakee near South Curtis Avenue. When I was growing up, this was a Hardees….and one of the good Hardees too that was operation during the whole Roy Rogers fried chicken and Rax Roast Beef days. I know in between the Hardees days and Poor Boy Too, a Mexican place was in the building for a while and I seem to remember an Asian buffet of some sort. Poor Boy took over the building in 2011 and really….it doesn’t look a whole lot different than when it was Hardees. The order counter is the same with the large menu boards hanging over heard. The furniture all looks the same just with a fresh paint job. This space is much bigger than the original location and has more of a fast food feel to it as compared to the (and I know we’re splitting hairs here) counter service neighborhood joint the original has. The menu is large. Like, insanely large. They really have something for everyone as long as you’re not a vegan. They do chicken. They do ribs. They do sandwiches. They do fish. They do gyros. There’s really no theme to this place except good greasy food. 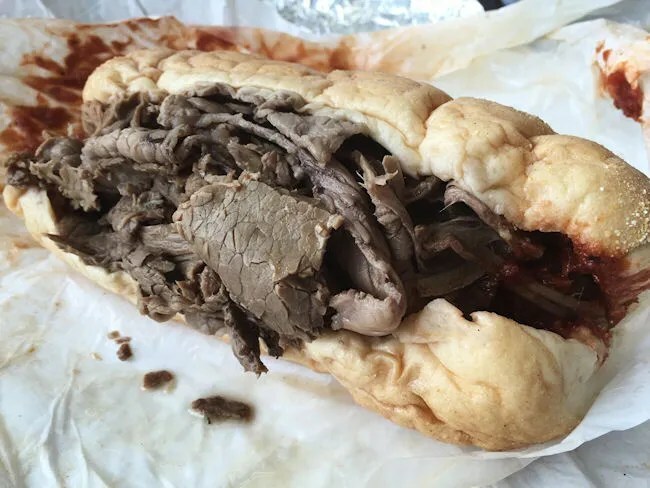 I ordered the Italian beef on French bread. I wasn’t offered hot peppers but I was offered red sauce so I figured, what the hell. I’m too close to Chicago to put red sauce on an Italian beef, but it was actually pretty good and gave the meat some flavor. That meat came on a crusty French roll which some of the au jus leaking from the meat, but the bun itself was never dipped nor was I asked if I wanted it that way. The sandwich was a pretty standard Italian beef. The meat tasted like it came frozen and was heated up in the gravy. It was good, but it wasn’t a Chicago beef. It was filling though and I even shared the fries that came with my meal with L because there was just too much food for me. My dad ordered the Patty Melt. There’s a running joke in my house about my dad and patty melts. J and I took them out to dinner one night and I don’t even remembered what he ordered, but it wasn’t called a patty melt. When we asked him how it was, his reply was, “It’s a glorified patty melt.” No. It is a patty melt…they just called it something different. So, now I laugh every time my dad orders a patty melt. I think we let him in on the joke a while ago….and I wouldn’t be surprised if he does it now just to screw with me. Poor Boy’s patty melt is a 100% beef burger topped with American cheese and grilled onions. You get the choice of a pita bread of rye. My dad chose rye and had nothing but good things to say about it. My mom ordered a hot dog and fries. They do Chicago Style Dogs, Coney Dogs (which they have the gall to call “Chili Dogs” 🙂 ) as well as a regular hot dog. My mom stuck to the regular dog which is an all beef hot dog with ketchup, mustard, pickles, relish & onions. With a couple of drinks and an extra order of fries, we got out of Poor Boy Too for around $20. L kept saying she wasn’t hungry and my mom had actually packed some healthy snacks so we brought those with us instead of ordering her something she wasn’t going to eat so that kept the price down a little bit too.